Jarron Jones’ draft process will revolve heavily around his medical past, but there is no denying that when healthy and consistent, he was a real difference-maker in the middle of the Fighting Irish defense. Notre Dame Graduate Student Jarron Jones has first-round ability, however, it’s incredibly unlikely that he will be selected within the first 32 selections. For a man of his size – 6’5″, 315lbs – he has rare athleticism and ability. Has both the size and power to remain a 4-3 DT in the NFL. Shows good burst and quickness off the line of scrimmage and is athletic enough to disengage, slip through gaps and keep his momentum whilst penetrating the backfield. If he’s unable to ‘slip’ into the backfield, Jones can use his impressive upper body power and leg drive to bull rush offensive lineman into the backfield and make a play on the ballcarrier. His long arms are incredibly useful. In the run game – even if he is engaged with blockers – he can bring the ballcarrier to the ground simply by lassoing them. In the passing game, they are incredibly effective in deflecting passes, and they also come in handy on special teams – Jones blocked four field goals during his college career. Like most defensive linemen his size, he tends to play with poor leverage, which causes his rush to stall, and he has no alternative moves to utilize when he arrives at this juncture. Inconsistency is the biggest issue of the Rochester, NY native on the field, and he also gets washed out of the hole far too often and doesn’t display the desired intensity through every play. Nonetheless, without a shadow of a doubt, injuries are the biggest drawback for Jarron Jones as an NFL Draft prospect. He missed the entire 2015 season after tearing his MCL during practice. Having already taken his redshirt year, he battled back to partake in the Fiesta Bowl against Ohio State, only to suffer a stress fracture in his foot, which limited his ability to practice this spring. In addition, Jones also suffered a Lisfranc injury in 2014 which caused him to miss the final two games of the season. 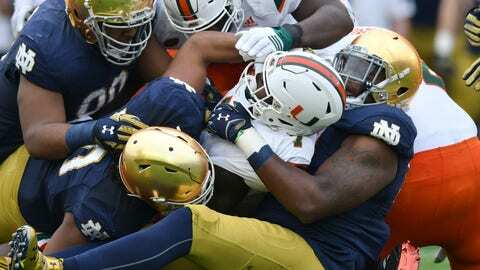 Battling back from injury has been the biggest issue for Jarron Jones. He also hasn’t been able to put it all together and translate his undeniable talent into football production on a consistent basis. Nonetheless, there are glimpses of a wrecking ball who is capable of dominating the line of scrimmage, and that’s the Jarron Jones one NFL team will hope to get.